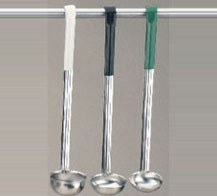 Completely sanitary and seamless, Ladles are constructed from 18-8 304 stainless steel. Extra strength and greater durability. Color Coded.